Glasgow-based architect Alan Dunlop, who visited the site over the weekend, said the destruction caused to the building is “irreparable”. “Mackintosh’s Glasgow School of Art is gone,” he told Dezeen. “It has been destroyed by fire, four years after an initial assault,” he said. More than 120 firefighters were called to Glasgow School of Art just before midnight on Friday to tackle the blaze, which spread from the building’s ground floor all the way up to the roof. Firefighters were able to get the fire under control after several hours. 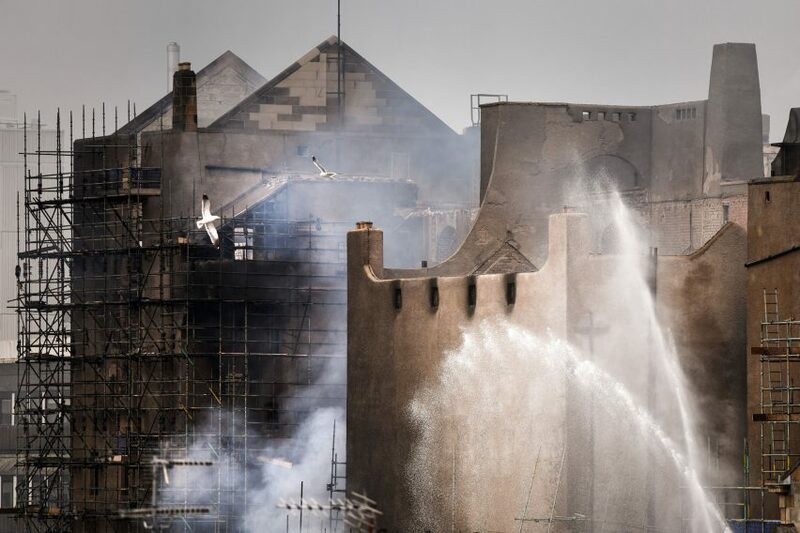 “The damage to the school of art appeared to be overwhelming, much worse than the last fire from which recovered materials were painstakingly analysed and used in the refurbishment of the building,” he told The Scotsman. “It is sadly questionable what, if anything, will be left that could be salvaged, restored or recreated after this fire,” he told the paper. Martin Hill, the fire officer in charge of the incident, said that thermal-imaging cameras were used to help them assess priorities during a “tactical firefighting operation”. Glasgow School of Art has issued a statement to reassure staff and students that its priority over the coming week will be “ensure minimum disruption”. Muriel Gray Chair, chair of the school’s board of governors, said she is hopeful that the building can be repaired. 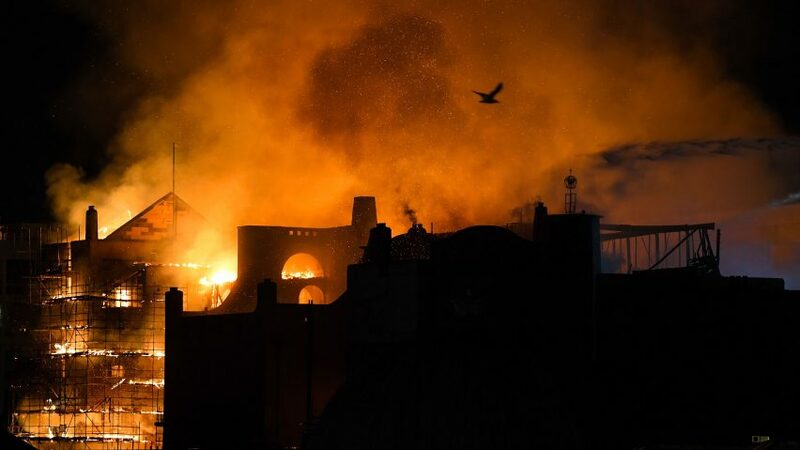 “We now have a difficult waiting game until Scottish Fire and Rescue Service, Glasgow City Council and associated agencies have completed their investigations into the condition of the building,” she said. The British Automatic Fire Sprinkler Association has told press that sprinklers were not yet operational in the building, as the refurbishment wasn’t complete. “However, it should be realised that sprinklers can be fitted in buildings throughout construction on a temporary basis, as there is a considerable risk from fire during this period,” the association told The Guardian. Completed in 1909, Glasgow School of Art is the best-known building designed by Mackintosh, Scotland’s most famous architect. Last month marked the 150th anniversary of Mackintosh’s birth. Dezeen published a special series to mark the occasion.